InnoDisk offers a wide range of industrial storage media, including both memory and flash disks. Within this category, wide operating temperatures, shock and vibration resistance, durability, and longevity are key factors. All common form factors are supported, including of course for CompactFlash, SATASlim, SDcard, and microSD. These storage media are based on either MLC or SLC (Industrial Grade, InnoRobust) technology. With Innodisk SSD’s, we bring an extra level of high-performance in memory storage. Innodisks wide selection of SSD’s are designed for different applications, including industrial/embedded, enterprise server, aerospace, defence, and other semi-industrial applications, such as thin clients, POS, and kiosks. Our SSDs come in SLC and MLC types, and SATA III (6.0Gb/s). Innodisk’s Serial ATA Disk on Module (SATADOM) is the world’s smallest form factor with exclusive Pin 7 VCC built-in, simplifying motherboard design. It is more robust, due to the lack of external cables, and enhances the disk functions of various industrial and enterprise applications. Innodisk’s SATADOM also supports the SATA III interface with faster data transfer rates and comes in capacities ranging from 1GB up to 128GB. With the Innodisk mSATA, we offer a low-profile interface connector, also known as a Mini-SATA. It’s ideally suited for integrating Serial ATA in a small form-factor drive, not bigger than a regular business card. It can also be integrated easily in a wide variety of hard drives and solid state disks (SSD’s) for use in applications, where space is at a premium, such as SBC's. Innodisk’s mSATA supports high-performance data transfer rates of 1.5Gb/s and 3.0Gb/s. 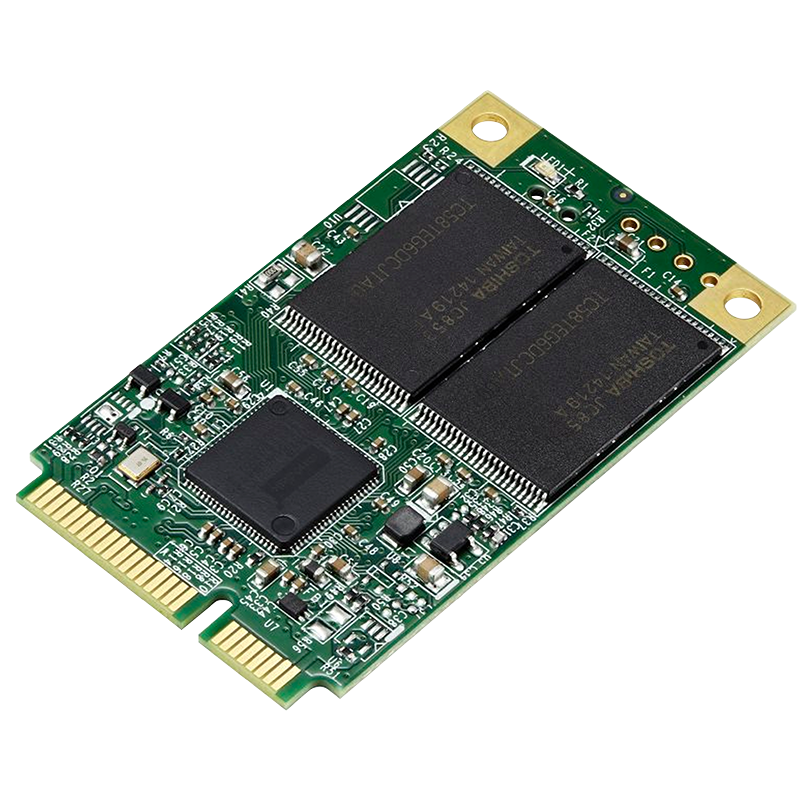 With the Innodisk SATA Slim we offer a storage solution that is compliant with the JEDEC MO-297 standard form factor and ATA protocol. It does not require drivers and can be configured as a boot device or a data storage device. It is also suitable for portable/hand-held devices, thin clients, and industrial applications that require the effective reduction of operation system boot time and power consumption. With a 7+15 pin SATA interface, the Innodisk SATA Slim supports most platforms with a standard SATA port. Innodisk SD cards and microSD cards are single-level flash devices built for rugged applications in the embedded fields. As an industrial-grade SD/microSD card, these cards deliver outstanding performance of up to 20MB per second, as well as excellent endurance and reliability, especially compared to other cards used in the mobile market. Innodisk’s SD and microSD cards are compatible with SD 1.1/2.0 standards and support SDHC Class 10. They also feature S.M.A.R.T. technology, which monitors the health of these SD cards. Innodisk’s industrial-grade USB storage solutions are built as SLC NAND flash and feature an attractive small form factor. They provides high-capacity flash memory storage while delivering faster data transmission with higher reliability. They also comply with the high-speed USB 2.0 interface and are backward compatible with USB 1.1. In addition, Innodisk USB series have a variety of special features, from plastic and metal housing to secure mounting holes to EDC and PCIe options. Innodisk’s Industrial CompactFlash Cards (iCF) are a high-capacity solid-state flash memory solution that electrically complies with the PCMCIA* ATA standard. Telerex offers them for replacement of rotating disk drives. Innodisk iCFs are embedded solid-state data storage systems, designed for mobile computing and the industrial workplace. Apart from a very robust build, they feature a low-profile form factor and are extremely light-weight.